Zentangled Alphabet - "V". 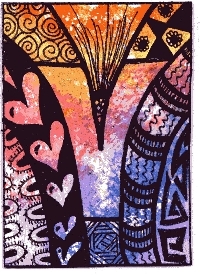 Zentangle an upper case V. On ATC sized, 2.5 inch x3.5 inch card stock or similar sturdy paper. You will have 1 swap partner for one Zentangled V ATC. Adding a color or using a colored paper or color washed background is optional. The usual Swap-bot rules apply. Newbie are welcome as long as they follow the swap requirements. Flaking will not be tolerated and you must be in good standing. Any problems contact your swap partner and me. If you flake on a letter, I will angel the letter for you BUT... you will be banned from further letters. Please make sure you are doing your best on these. I have had some people comment on receiving questionable zentangles. They have been generous in their ratings, but your zentangles should be taking some time and effort. Don't just slap some lines on a card, draw a letter and call it a day. I or someone else will be having 'Letter Make-Up swaps' from time to time, too, if you miss a letter and want to get caught up! where is your V!!! I so look forward to seeing what you did previously! Oops! I have my pics on a different computer than the one I posted the swap from. I will put one there soon! And this was one of my favorites, too! Glad I scanned them before I sent them out! They were part of a whole alphabet series!